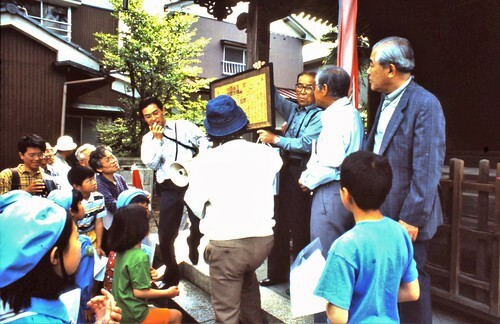 The Tachiaoikai of the 1990s was holding local history fieldtrips by bus and by foot to introduce members and the public to some of the places and events of the city of Takefu (today's Echizen city) and surrounding towns and villages. This Shinto shrine memorializes the early ruler of Japan, Shotoku Taishi. The chart being displayed tells about a non-Western notation for mathematical calculations.